To teach and inspire; to reach and transform. Every student. Every year. To graduate students who experience a rigorous academic program and emerge as confident critical thinkers who embrace challenges, demonstrate resiliency, and are empowered to pursue personal goals and contribute positively to their communities. RIGOR – We hold high expectations academically and behaviorally of all students. Teachers provide challenging, stimulating instruction that emphasizes critical thinking, encourages creativity, and builds confidence. RELATIONSHIPS – We create innovative programs to establish meaningful relationships between students and staff. These relationships increase trust, enhance motivation and improve academic performance. 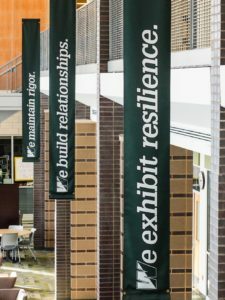 RESILIENCE – We challenge students through demanding coursework and extracurricular involvement to demonstrate the courage to take positive risks, learn from mistakes, value perseverance and strive for excellence. RESPONSIBILITY – We expect students to value diversity, demonstrate high moral character and commit to become caring, engaged citizens of a global community. RESULTS – We create a passion for excellence through the collaborative efforts of staff, students, parents and the community. We develop students who possess positive self-esteem, feel confidently prepared for college or a career and commit to being lifelong learners.